Sun Mahshene plays The Midnight Hour in Whelan’s (Upstairs). Support on the night comes from Glossolalia. 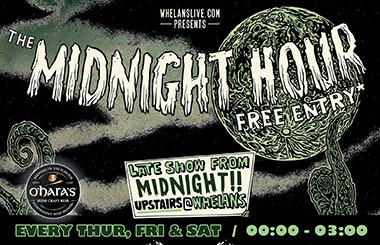 Entry to Whelan’s is FREE before 10:30pm, Club entry of €10 applies after 10:30pm. Put your name in the event discussion to be added to the free entry list! A psychedelic rock’n’roll band from Dublin who want to brainwash you.